Okay, we’ll admit it, it is incredibly difficult to look at a slow loris and not instantly break out in an “aww!” With their big eyes and fuzzy tails, it’s a natural response. Unfortunately, that same reaction has led many to want to keep these animals as pets. But there is a huge difference between these wild animals and the fluffy dogs and cats we share our homes with. Slow lorises are native to the jungles of Indonesia and while they might look sweet and adorable on the outside, they are venomous. Not only do they have fangs that are reinforced with venom but also sharp and strong claws. Both of these natural evolutionary traits make them a less than “ideal” pet, but that hasn’t stopped their rampant exploitation in the exotic animal trade. Thankfully, he has been given all the care he needs to recover and is slowly learning what it means to be a wild loris. Here, we see him learning to climb a tree! IAR hopes that with time he will become independent enough to return to the wild. 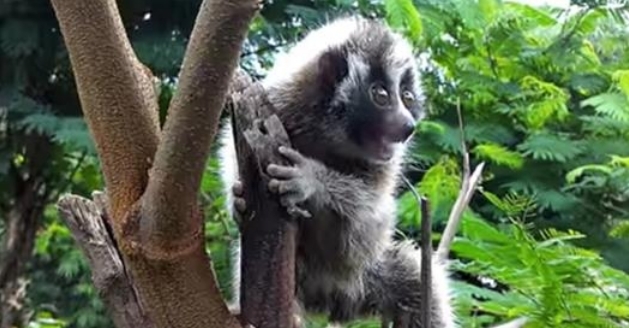 Responses to "Traumatized Baby Slow Loris Rescued From Pet Trade Learning How to Climb Trees"